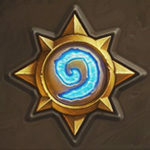 The Best Neutral Hearthstone Epics – Which Neutral Epics Were Strongest? When it comes to Hearthstone’s rarity distribution, Epic is probably the most interesting one. The reason why Legendaries exist is simple – they’re unique characters, or cards that devs want to have restricted to one per deck. Commons and Rares are pretty easy to explain too – Commons are the most basic, simplest cards, while Rares have some more synergies or effects that are a bit more unique. And since they’re both relatively cheap and easy to obtain, there’s no reason to complain whether a card is a Common or Rare. However, Epic cards are significantly pricier, and yet they don’t have the same restrictions that Legendaries do, nor do they feature any well-known characters. Sometimes their effects are really unique and crazy, other times they are not that different from Rares (or maybe even Commons). The fact that you can get two of each, there are multiple new Epics per expansion and that they don’t fall under the no duplicates rule that Legendaries do, they’re also the hardest rarity to collect. But whether we like it or not, Epics do exist, and multiple powerful cards in the past have boasted this rarity. In this article, or rather two articles, I’d like to take a look at them and analyze how powerful they are (or were), as well as their impact on the game in general. Since there are so many Epics, I’ll split this article into two (just like I did with Legendaries). This one will list the Neutral Epics, while the latter will do the same for Class Epics. Important – read before proceeding to the list. When creating this list, I looked at the cards’ overall performance against the field during the time they were in Standard. I’m NOT ranking them on how they perform in the Wild format, and when talking about a card that’s still in Standard, I’m taking both the present and the past into account. For the cards that were nerfed, I’m considering their pre-nerf state (as long as they made enough impact to even be on the list) as well as the post-nerf state (e.g. if the card was nerfed after 2 months and then it was useless ever since, I probably won’t put it on the list). The order of cards is alphabetical, it would be night impossible to objectively rank them. 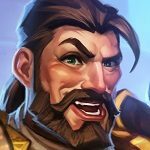 Check out more of our best of articles: Best Decks in Hearthstone’s History, Best Class Legendaries, Best Neutral Legendaries, and Best Hearthstone Expansions! First I’ll start with some honorable mentions. Those are the Neutral Epics that were closest to getting onto the best list. They all had their moment in the meta (and some of them still have), but they weren’t as impactful. Arcane Tyrant – Minions that can be dropped for free are almost scary (as long as they have meaningful stats that is, unlike something like Wisp) and Arcane Tyrant is a great example. While the card has seen most play in Druid, it has been auto-include in basically every deck of that class for a while already. Between access to multiple 5+ cost spells (Nourish, Spreading Plague, Ultimate Infestation), ability to ramp, hand size issues and the desperate need for some mid game tempo, Arcane Tyrant is a perfect fit. A very powerful card with lots of potential. Fel Reaver – Fel Reaver is a relic of the past. Most new players don’t even know that such a card existed, but it was the first “big, midrange minion with a clear downside” card (trend that was later explored with cards such as Flamewreathed Faceless or Bittertide Hydra). 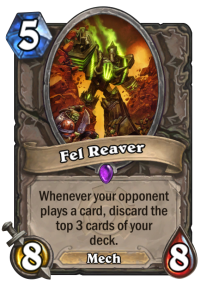 I remember when Fel Reaver was a topic of hundreds of discussions at the time – lots of players didn’t like to play him, because an opponent burning your cards felt bad. But in reality, if you were playing him in Aggro, it didn’t matter. Burning cards in Aggro doesn’t matter unless you actually get to fatigue. If he was on the board long enough for your opponent to burn your entire deck, then you probably won the game anyway. The only exception was playing him against Freeze Mage, who could make it unable to attack over and over again, while slowly removing your deck. It was an interesting dynamic, but in general, the card was much more safe to play than one might expect, and was utilized by multiple Aggro decks (especially Mech-oriented builds, but also was a great addition to Aggro Druid, who could Innervate it out on Turn 3). Gluttonous Ooze – Gluttonous Ooze was an unexpected Hero of many Hearthstone decks. It might seem that while he might be slightly better than Acidic Swamp Ooze at times (worse stats for the mana cost, but potentially gains some Armor), but no one expected that it would nearly push out the Basic Ooze from the meta. As it turned out, the main advantage of Gluttonous Ooze turned out to be the fact that he can be played in the decks that can’t play Acidic Swamp Ooze. Prince Keleseth decks and Odd (Baku the Mooneater) decks are some of the best examples. Other examples include decks that already played enough 2 mana cards, but had a nearly empty 3 mana slot and wanted to fill it. Overall, Gluttonous Ooze being gone from the meta won’t be THAT big of a deal, since there are other weapon destruction options readily available, but the card deserves a mention here. Molten Giant (Pre-Nerf) – Pre-Nerf Molten Giant was one of my favorite cards in the entire game. Matchups as and against Handlock had an interesting dynamic. Similarly how you don’t want to get Even Warlocks down to 15 right now (so they can’t play a buffed Hooked Reaver), back in the day you also didn’t want to get Warlock too low, or it could backfire. 15 health was also the barrier you didn’t want to pass most of the time. Getting them to 10 or below meant that they can drop Giants for free, usually followed by a Sunfury Protector or Defender of Argus. It was a nightmare for Aggro decks. Giants also found their home in another deck you might not have heard about – Giants OTK Warrior. Warsong Commander used to give all minions Charge (crazy, right?) before it was nerfed to give it only to 3 or less Attack minions (and then basically killed off). The deck’s game plan was to get low enough so you can play free Giants, and then start charging them at the opponent while bouncing them back with Youthful Brewmasters. Either way, Molten Giants have seen some action. 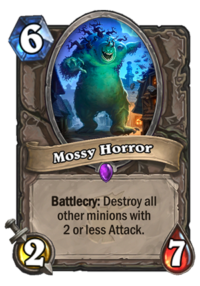 Mossy Horror – Mossy Horror is one of the most recent cards on the list. It has proven its value in the current expansion (Boomsday Project), before Giggling Inventor was nerfed. It was a perfect counter, which often hit some more minions on top of that. But once players got to play around with it, it turned out that Mossy is still a solid card despite Giggling being gone from the meta. It really counters some of the decks, such as Odd Paladin or Even Shaman. While its popularity has dropped a bit, it’s still one of the most played cards on the ladder. And given that next expansion is bringing Spirit cards (0/3’s that start with one turn of Stealth), Mossy might remain a viable tech. Primordial Drake – Let’s be honest. Primordial Drake is not an exciting card, it wasn’t played because of its cool effect or something like that. It just turned out to be a solid late game option, especially in the decks that had limited AoE or Taunt synergies. While 4/8 stats are not very powerful for an 8 mana Taunt (you’d expect those kind of stats on a 6-drop), the 2 AoE damage is what made it so good. It was a great anti-Aggro card that was useful in slower matchups too. Between clearing the board and putting a big Taunt in your way, it was a sure way to seal a lot of the faster games. And while the AoE wasn’t as useful in slower matchups, the body was still alright, especially against Priest, who couldn’t answer it with Shadow Words (too big for Pain, too small for Death). Dragon tag was an icing on the cake, it made the card especially useful in Dragon Priest (this style of card would fit into the deck anyway, but it was even better with a Dragon tag). 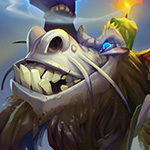 Shade of Naxxramas – Shade is mostly associated with one deck, in which it was staple for roughly 1.5 years – Midrange Druid. It’s an interesting card, because it starts really slowly. Playing a 3 mana 2/2 is terrible, and risky. It dies to a lot of AoEs and can’t do much yet. At the time you can first attack with it, it’s already 3/3. Still bad for 3 mana, but you might actually want to trade it. Then, when it becomes 4/4, it’s already solid value. Anything above that is amazing. Most of the time, it wasn’t worth to reveal him too early. Druid could wait until it grew to let’s say 8/8 before even attacking with it. It was even more powerful when it supplemented your Force of Nature (used to summon 3x 2/2 with Charge that died at the end of the turn) + Savage Roar combo. The base 14 damage could increase by let’s say 6, 8 or even more quite easily with a hidden Shade. Midrange Druid wasn’t the only deck that played it, but most of the other builds couldn’t utilize it to the same extent. Skulking Geist – Geist turned out to be a way more popular tech than I expected it to be. Ever since the card was printed, there was no meta in which it was useless. No matter if it was Priest running Inner Fire / Holy Smite for their combos, Druid with Naturalize, Warlock with Dark Pact, Hunter with Play Dead, Warrior with Shield Slam / Omega Assembly, the card found its niche every single expansion. While its body is quite weak for the mana cost, destroying some of the vital cards in popular meta decks was well worth it. 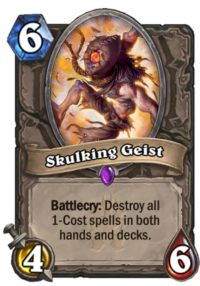 Geist could also be utilized in fatigue strategies – after all, removing a bunch of cards from your opponent’s deck put them significantly closer to fatigue. Southsea Captain – Whenever Pirate decks were good, so was Southsea Captain. Sadly for him, it wasn’t very often. Pirate Warrior was the only truly viable Pirate deck in Standard, but oh boy, was Captain good in that deck. With a bunch of Pirates on the board, not only did it provide a lot of immediate damage, but also made them harder to clear (or made some trades possible). Pretty late into Patches the Pirate‘s existence (before the card was nerfed), it also started becoming a part of so-called “Pirate Package”. Basically, multiple decks that didn’t have anything to do with Pirates have played Patches + 2 activators just because of how powerful the card was. While initially Bloodsail Corsair was the more common activator in the decks without weapons, later Southsea Captain became a go-to option in some builds. Pulling Patches as a 2/2 made a quite significant difference at the times. The card has actually a chance to make a comeback soon, since Rastakhan’s Rumble should have some Pirate accents. Twilight Guardian – While BRM was THE Dragon expansion, Dragon decks really took off around TGT, when Twilight Guardian was printed. The card was really good, and it fit into the Dragon theme perfectly. The decks wanted to play strong minions on the curve and outtempo / overwhelm opponent on the board. 3/6 Taunt for 4 is pretty good, it has better than vanilla stats (compared to Sen'jin Shieldmasta), but let’s be honest, even at the time it wasn’t particularly amazing. However, what made this card so strong is the Dragon tag. It basically means that on top of being an above average minion, it could also serve as a Dragon activator for other cards (which couldn’t be said about some other synergy cards, such as Wyrmrest Agent or Blackwing Corruptor). 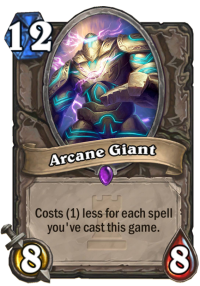 I open the main list with Arcane Giant, which is probably the strongest Giant this game had. 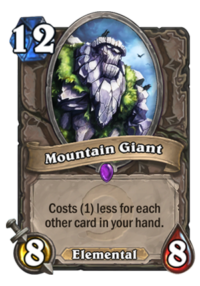 While Mountain Giant comes really close, I feel like it was a bit less impactful, because it was realistically played only in a single class, unlike Giants, which found home in a few different ones. Arcane Giant has dominated One Night in Karazhan meta, but it has seen a bunch of play afterwards too. Probably the most prominent deck that used it was Malygos or Yogg Druid, which was one of the best decks at the time (before Yogg-Saron, Hope's End got nerfed, that is). Not unlike the current Druid lists, majority of the deck were spells, which means that it was rather easy to get Arcane Giant down to 0 mana, or at least close. And as you can imagine, dropping 0 mana 8/8’s is quite powerful. While the current Arcane Tyrant is easier to pull off, it doesn’t put nearly as much pressure as Giants did. Another Druid deck in which Arcane Giant has seen some play was Token Druid (a bit similar to the Token Druid decks we have right now) – it was a great late game refill in there. Another deck that commonly featured Giants was actually Miracle Rogue. There were two main builds of the deck – one that played Giants and other with Leeroy Jenkins + Cold Blood. While those two weren’t mutually exclusive, the deck had only so many slots for game finishers. Giants were not only quite easy to get down to 0 mana after an Gadgetzan Auctioneer turn or two, but they also had amazing synergy with Valeera the Hollow (and Vanish, to a certain extent). Even though you had only two Arcane Giants in your deck, if the game required a lot of late game pressure, you could put WAY more of them on the board over a few turns. While less common than those two, Giants were also sometimes used as a finisher in Tempo Mage, as well as a part of the combo in Dead Man's Hand Warrior. Overall, they were played in at least 3 or 4 competitive decks over their lifetime in Standard, as well as in a bunch of off-meta decks. They definitely deserve a slot on this list. 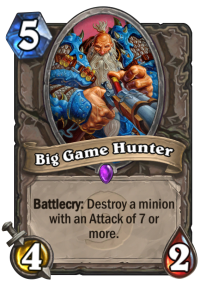 The list will have a bunch of pre-nerf card, and Big Game Hunter is one of them. The current 5 mana version sees play sometimes, in decks that lack removal or maybe when the meta is heavy on big minions. However, imagine that the card used to cost 3 mana with the exact same stats and same effect before. Yes, it was a really, really powerful tech. Big Game Hunter wasn’t very popular back in Classic or Naxxramas, but it doesn’t meant that it hasn’t seen play. It was a semi-common tech against Handlock – the deck ran four Giants after all, so there were plenty of targets. However, other 7+ attack minions were pretty uncommon at the time. Everything has changed when Goblins vs Gnomes launched. The expansion added one of the most powerful Legendaries in the history of Hearthstone – Dr. Boom. Given it’s big, 7/7 body and the fact that it was played in half of the decks on the ladder (maybe that’s a bit of an overstatement, but it was VERY popular), BGH became a much more common tech, especially in the decks that don’t have powerful single target removal (like Druid). The best thing about the old BGH was that it was somewhat usable even in the matchups in which you didn’t need it. Of course, a 3 mana 4/2 is not great, but it’s still something you can drop on Turn 3 without losing that much tempo. At 5 mana? Not anymore. The card was nerfed with the first Standard rotation, in Whispers of the Old Gods. But I keep wondering how much play it would see after that if it wasn’t nerfed. Not many players did expect Cube to get as popular and strong as it is right now. Despite most of the pros seeing its potential, it was seen as something too slow to really function in a meta. Not only you need to sacrifice a minion you already have on the board (probably something bigger for it to be really worth), but then Cube still needs to die. Plus it’s very vulnerable to Silence and transform effects. And yes, that’s kind of true. Cube is a very slow and a pretty clunky card… unless you can trigger it yourself. And that’s how Cube Warlock was first created. The deck used to run 2x Dark Pact, as well as (most of the time) Spiritsinger Umbra, both of which let the Warlock player trigger Cube before the opponent has a chance to interact with it. And as it turned out, plays like trading Giant into something, then Cubing + Dark Pacting it to create two full health Giants were often game-winning. Even though the card could get you a lot of value, the best use for it was a bit different. If you had Doomguard on the board… or rather, when you pulled it out of your hand with Skull of the Man'ari or out of your deck with Possessed Lackey, playing Cube + Dark Pact on it was a great way to burst the opponent down. The combo was 15 damage, but if you added Umbra to the mix, you could deal 25 damage. Even if your opponent has dealt with it, copying Doomguard so many times flooded your Demon pool with it, meaning that Bloodreaver Gul'dan usually resurrected a bunch of them. It took two major nerfs to temper the deck, but even after them, it was still a semi-viable build (it just happened that Even Warlock turned out to be stronger). 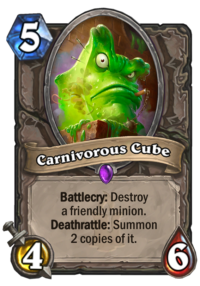 But it wasn’t over for Carnivorous Cube, as it has found another home – this time in Hunter. The class turned out to be a perfect candidate to play Cube in. Not only it had a lot of great targets to Cube (Witchwood Grizzly or Charged Devilsaur, for example), but it could also trigger it immediately with Play Dead or Terrorscale Stalker. The optimized version of the deck that started seeing play around Witchwood has became one of the best (if not THE best) decks in Boomsday Project and Cube is a significant part of its success. Cube is also an amazing card for deck builders that want to play around with some combos. While not always most efficient, combos like Cubing the Malygos or Cubing Charged Devilsaur just to trigger them all at the same time and kill the opponent… Those are usually off meta or low tier decks, but they’re really fun to play around and – most importantly – activated by this Epic card. If I had to name the most underrated card in the history of Hearthstone, Corridor Creeper would definitely be in the top 3. While some players have seen it as an okay card, the general consensus was that it’s not consistent enough and hard to discount. Which, of course, wasn’t true. Keep in mind that before the nerf, Corridor Creeper was a 5/5 minion. So technically, playing him for 4 mana was already a positive tempo play. Anything lower than that and it was great. At 0 mana, which happened very commonly, it was absolutely nuts. And so, the card started seeing play in every single aggressive deck. There was just no reason to not play it – between your minions dying and your opponent’s minions dying, you could often drop him on Turn 3-4 for free in an Aggro mirror. Midrange decks – the same thing. On top of a free tempo, it gave the decks a great Bonemare target on Turn 7 (yes… the card was also nerfed) even on an empty board. It was so good that even some slower decks have started running it to get this positive tempo swing in the mid game (it was harder to get down to 0, but Control decks also had more time to do it). 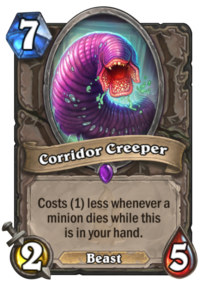 The card was nerfed quite quickly, because only after 2 months, but those entire two months were FULL of Corridor Creeper. For those of you who started playing Hearthstone after that, the card was roughly as popular as Giggling Inventor was before the nerfs, but it was even harder to counter. Even after the nerf, Corridor Creeper has still seen some play, mostly in two decks. One is Odd Paladin – while 2/5 is not a 5/5, the card is so easy to get down to 0 mana here, and you definitely can’t pass on the free 2/5 in an aggressive deck. The other deck is Evolve (when it was still in Stadnard) and later Tempo Shudderwock Shaman – even after you get the minion down to 0 mana, it still counts as a 7 mana minion for the sake of Evolve effects, meaning that you could easily turn him into a random 8-drop, 9-drop or even a 10-drop. I have to say that nerfing him to 2/5 was a great decision, because he still was a viable card in some cases, but was no longer so popular all over the ladder. Doomsayer is probably the most impactful Epic Hearthstone ever had. Back in the day, it was mostly seen as a Freeze Mage thing – combined with Frost Nova or Blizzard was a quite consistent way to clear the boards. Given that you have frozen the minions and they could directly threaten your Doomsayer, if your opponent had no direct removal or at least Silence, the entire board flew, and Mage started with initiative. It was a really cool way to use this card, but as it turned out, not the only one. It took a few expansions for players to start utilizing Doomsayer as simply an anti-Aggro measure. Without any board freezes, when dropped on Turn 2, Doomsayer had a significant chance to go off. And when it did, not only it destroyed whatever your opponent had on the board (1-drop/2-drop, maybe both), but also passed initiative to you. It was a board clear combined with forcing your opponent to skip any tempo he would have created that turn, at the cost of some face damage. Of course, it didn’t always work that way – opponent might have had enough damage to kill it. That was bad, but not the worst thing ever – it still tanked you 7 or more damage (if your opponent had to overkill it). The worst case scenario was an anti-Doomsayer tech like Silence or Void Ripper, which dealt with it without having to sacrifice tons of damage or losing much tempo. Another way to use Doomsayer was in the mid / late game, after a board clear. The thing about board clears is that most of the time you’re passing the initiative back to your opponent. Yes, you clear a board, but you rarely do much more than that. If you had enough mana to drop a Doomsayer on top of a board clear, it often forced your opponent to skip the turn, and gave you opportunity to actually develop something, draw cards, heal up etc. while opponent had an empty board. This kind of play also works against slower decks, oftentimes they either don’t have another removal for Doomsayer or just don’t want to use their premium single target removal on a 2-drop when you could drop something bigger right after. 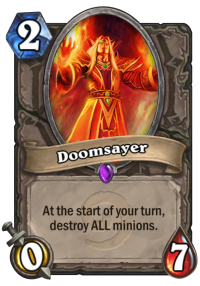 And so, during the last two Standard years, Doomsayer is one of the most popular cards in pretty much every meta, especially whenever some high tempo early game decks become popular. Dirty Rat was the first Neutral combo disruption card we’ve got, and the entire player base had very mixed feelings about it. Some loved it for the ability to interact with your opponent, others have hated it for being an uninteractive combo counter, and an RNG one on top of that. 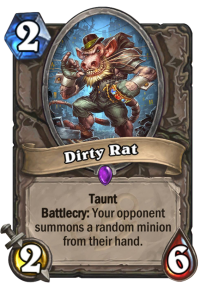 But either way, Dirty Rat has made a massive impact on the meta for as long as it was in Standard. The card was also mostly underrated at first. Because let’s be honest, it generally looks too risky to play. 2 mana 2/6 Taunt is great, but pulling a big minion from your opponent’s hand has a huge chance to backfire. The most infamous situations were the ones where you’ve pulled something like Deathwing, which would normally be a dead card in your opponent’s hand for the majority of the game. On the other hand, Dirty Rat was a combo decks killer. Most of the combos in Hearthstone revolve around a certain minion. It might be Leeroy Jenkins, Malygos, Archmage Antonidas or Prophet Velen, but the thing is that you rarely can combo your opponent down with spells alone. And Dirty Rat was a great way to play around those combos. In the late game, especially when you’ve expected that your opponent might already be holding onto their combo, you dropped Dirty Rat, hopefully pulling out whatever you’ve wanted, and finished it off with a removal. The only counter-play was holding onto more minions, praying to RNJesus that the relevant ones won’t get pulled. The card actually had some more uses. For example, against Aggro, it was amazing once they have ran out of minions in their hand (which against some decks happened pretty quickly) – 2/6 Taunt for 2 mana was great. You could also pull out a Charge minion from their hand and kill it before it had an opportunity to hit your face. Against Control decks, you could also pull the cards they didn’t want to play at the time. For example, Acolyte of Pain in the matchups where your opponent didn’t want to draw, or even one of their win conditions to deal with it on your own terms while skipping the Battlecry (e.g. C'Thun or N'Zoth, The Corruptor). Dirty Rat had a massive resurgence on the Wild ladder before the recent set of nerfs too. Nearly every Druid deck was playing Aviana + Kun the Forgotten King combos, and Dirty Rat was the best way to combo those (and often the only option Control decks had to win against those Druid builds). 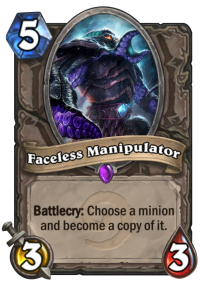 Faceless Manipualtor is probably the most flexible card in the entire game. After all, it can be literally anything – as long as that thing is on the board already. If the meta was about Control and Control only, it would probably be auto-include into every single deck. But the problem is that against Aggro you rarely have something to copy, and by the time you drop your big minions, it might be too late. So in the end, the card was mostly played as a part of different combos. One of the most famous ones was the Leeroy Jenkins + Power Overwhelming + Faceless Manipulator for 20 damage burst (you could do that back when Leeroy costed 4 mana, or later with the help of Emperor Thaurissan). It was a go-to finishing move first in Handlock and later in RenoLock. Then it was played in some Malygos decks back in the day, because obviously, copying Malygos is a great way for your spells to be even more deadly (he was used in Malygos Druid quite recently, actually, before Flobbidinous Floop was released). Another example of the card’s use was Cube Warlock. The deck was consistently pulling big bombs that were worth copying in the mid game, so Faceless was much more consistent in that build. Faceless had a very combo-oriented nature, so Faceless has fit in there perfectly. And of course, the card was used in dozens and dozens of clunky combos that were never supposed to work, or worked well enough to become off-meta decks, but not more than that. I suspect that the card will still see a lot more play in the future. Like I’ve mentioned when talking about Arcane Giant, I believe that Mountain Giant is the second most impactful Giant in Hearthstone. But the problem with this card is that it could have as well been a Warlock card and it wouldn’t be that much different. It was always played as a big threat in slower Warlock builds. Starting with the oldschool Handlock, it was one of the deck’s main win conditions. While you had to sacrifice most of the early game tempo, dropping a massive 8/8 on Turn 4 was enough to seal a lot of games by itself, not to mention that it was often followed by a second one, Twilight Drake, or at least Taunted up so your opponent couldn’t rush you down. Later, the card was commonly played in RenoLock. It was so good that some players have tried playing it as two-of, a decision I didn’t really agree with, but I remember it working for some. In Kobolds & Catacombs and early Witchwood, a pair of them was nearly a staple in Cube Warlock, a deck that was all about putting pressure on the board with big, but mana efficient minions. And finally, a deck that is still relevant (and one of the best decks on the ladder, actually) right now – Even Warlock. Reducing the cost of Life Tap to 1 mana makes Mountain Giants even more juicy. Not only you can drop one on Turn 3 if you’re going second, but you have a nearly full hand for the majority of the game, so it’s always a cheap and solid play. A big portion of Even Warlock games end around Turn 6-7 after dropping an early Giant followed by some other minions. Double Giant opener is amazing, especially if you start with a Coin. Even against Aggro, something like T3 Giant, T4 Giant + Coin + Sunfury Protector is like a sure victory. Yes, Mountain Giant was briefly played in other classes too. I remember older Control Paladin builds running it. Recently, it was also featured in Elemental Mage, a deck for which massive hand size isn’t something weird. But the problem is that it rarely worked as well as in Warlock, because other classes have no consistent way of pulling him out on Turn 4 (or sometimes even 3 with Even Warlock), when it’s most deadly. Murloc decks have a pretty long history in Hearthstone, but most of the time it was a history of off-meta decks. Back in the day, we had builds like Murloc Shaman, Murloc Warlock and even Murloc Druid (which started as a meme, but some people actually had success with it), but for the most part, they were off-meta decks that never really took off. But after a while, players have realized that the best class to play Murlocs in is… Paladin. The deck had three different surges of popularity. First, when Murloc Knight was released back in TGT. While it was slotted into multiple decks at the time, a dedicated Murloc build was a thing. Then, it was played as a combo deck after Anyfin Can Happen build became a possibility in League of Explorers (although it was more popular next year). And finally, in Journey to Un’Goro, when the class has got some nice tools, including a 2-drop Murloc – Hydrologist. But more important than Hydrologist were other cards, such as Neutral Rockpool Hunter and Gentle Megasaur, as well as Vilefin Inquisitor back from WotG. In every single of those decks, Murloc Warleader has played a very important role. In the generic Murloc decks, it was a way to snowball the board, trade up or push for lethal. In the combo deck, it was one of the main sources of damage. Reviving 2-3 of them alongside cards like Bluegill Warrior and Old Murk-Eye was a nearly guaranteed lethal. But thanks to a single Legendary from Mean Streets of Gadgetzan, Murlocs became much more widespread than anyone has imagined at the time. Thanks to Finja, the Flying Star a so-called “Murloc package” was created. Players put Finja with two Bluegills and two Warleaders into their decks. Playing Finja on the curve and triggering the effect was an amazing way to snowball the board. Ideally, pulling 2x Warleader or Warleader + Bluegill was the best case scenario, but even two 2/1’s with Charge were great. That kind of package was played in many different decks – Tempo Rogue, Token Druid and even Pirate Warrior. In the end, it has disappeared from the meta when players started teching in Hungry Crab as a counter, but it had its impact on the game. And so, eventually Murloc Warleader was nerfed. To be honest, players haven’t expected that nerf, because it wasn’t very oppressive at the time (Murloc Paladin was a good deck, but it wasn’t even that popular), but the general consensus was that it was necessary. The card was too strong. 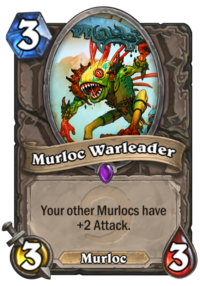 Instead of giving all Murlocs +2/+1, making them harder to clear ON TOP of way more offensive, it now only gives +2 Attack. It’s still an amazing card, an auto-include into every Murloc deck (such as the more recent Murloc Mage build, another surprising creation), but it’s no longer as dominating as it once was. And last, but not least, the card that has given PTSD to many – Spiteful Summoner. The idea behind Spiteful decks was really simple. You played a deck full of minions, with two copies of Spiteful Summoner and 2-4 expensive spells. 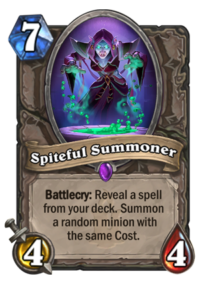 The upside was that once you dropped Spiteful, it had a 100% chance to pull one of the expensive spells and summon a huge minion. Getting a 6 mana Tirion Fordring or Deathwing on top of a 4/4 body was a huge play, often enough to win the game. The downside was that you could not play any cheaper spells, as they would interfere with Spiteful. The first really viable Spiteful deck was Spiteful Priest. The deck was based around Dragon Package, which had a really strong curve, plus a lot of minions which acted as removals (e.g. Duskbreaker or Twilight Acolyte), so for the most part, the deck didn’t really need those early / mid game spells. As for the high cost spells, it played 2x Free From Amber and 2x Mind Control – pulling either of those was great with Spiteful. But what made the deck even better is an addition of Grand Archivist. It wasn’t as important as Spiteful itself, more like an icing on the cake (mostly because it was pretty random), but it pulling the right spell at the right time was amazing. Just imagine – your opponent has dropped a big bomb on you, let’s say The Lich King. You play Grand Archivist, which pulls Mind Control. Some players would just concede out of frustration. Another viable deck based around this card was Spiteful Druid. This time around, it only played 2 spells – 2x Ultimate Infestation. It has consistently pulled a 10-drops, an it was a good spell to cast with Archivist (basically no matter what it hit, it was good), but you ran into a much higher risk of drawing both copies before Spiteful. It didn’t discourage players from using the deck, and it quickly became one of the better builds on the ladder around The Witchwood. Other than that, we had a few less popular Spiteful builds, such as Spiteful Hunter (with Call of the Wild), Spiteful Paladin (with Call to Arms and Dinosize, so it was kind of a high-roll deck) and even a Spiteful Pirate Warrior (with Lesser Mithril Spellstone). But finally, around the middle of The Witchwood, the card was nerfed. The mana cost was increased from 6 to 7. It might not seem like much, but given that the decks heavily relied on getting Spiteful as soon as possible, giving opponents one more turn to find an answer, develop something etc. was what you wanted to do. Even after the nerfs, Spiteful Druid has seen some play, but it was definitely a niche, off-meta build. The card still has one more expansion before it rotates out, but at this point it’s hard to say what would make it a viable pick. Another long post, as it seems! But talking about Best Epics isn’t much easier than talking about Best Legendaries. In both cases, there are lots of candidates and the choices are very difficult. The line between some of the honorable mentions and actual list is thin. What do you think about the list? Do you agree with it? What are, in your opinion, the best Neutral Epics in Hearthstone? The list of best Class Epics is coming soon-ish (I hope that I’ll manage to finish it before the reveal season starts), so stay tuned. Anyway, thank you all for reading it. Good luck on the ladder and until next time! The second paragraph for Arcane Giant seems to be missing some text at the end.